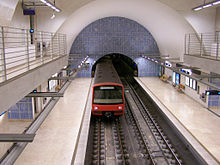 The Lisbon Metro (Portuguese: Metropolitano de Lisboa) is the rapid transit system of Lisbon, Portugal. Opened in December 1959, it was the first subway system in Portugal. As of 2017[update], the system's four lines total 44.2 kilometres (27.5 mi) of route and serve 56 stations. The idea of building a system of underground railways for the city of Lisbon first arose in 1888. It was first proposed by Henrique de Lima e Cunha, a military engineer who had published a proposal in the journal Obras Públicas e Minas (Public Works and Mines) for a network with several lines that could serve the Portuguese capital. Concrete plans took longer to evolve, though. Lanoel Aussenac d'Abel and Abel Coelho presented theirs in 1923, and José Manteca Roger and Juan Luque Argenti theirs one year later, in 1924. None of these plans were carried out. After World War II, in which Portugal remained neutral, the national economy took off and the financial possibilities arising from the Marshall Plan provided a strong boost to the potential construction of a metro in Lisbon. A society was formed on January 26, 1948, with the purpose of studying the technical and economic feasibility of the project. Lisbon Metro System in 1959, when it was inaugurated. Construction began on August 7, 1955, and four years later, on December 29, 1959, the Lisbon Metro was inaugurated. The network was formed by a Y-shaped line linking Restauradores to Rotunda (now Marquês de Pombal), branching then to Entre Campos and to Sete Rios (now Jardim Zoológico), where the rolling stock depot (PMO I) which was also linked to the outer-loop Cintura Line of CP was located. The new system was well received by the public, and in the first year the Metro carried more than 15.3 million passengers. The metro has proved an important factor in urban development of the city, outlining new areas of housing and services. In 1963 it was expanded from Restauradores to Rossio, then further to Anjos (in 1966) and finally to Alvalade (in 1972). After this first extension, no further stations were opened until 1988. In 1974, after the Carnation Revolution, the management model was changed, being nationalized in 1975 and renamed Metropolitano de Lisboa, EP in 1978. Under the new management, works were carried to enlarge platforms, originally designed to receive two cars, so that these could receive four cars. Lisbon Metro System in October 1988. Train of the Lisbon Metro in Telheiras station (Green Line). The 1980s were marked by several extension programmes. First from Alvalade to Calvanas, in 1980, then from Sete Rios (now Jardim Zoológico) to Colégio Militar/Luz in 1982, and Calvanas to Campo Grande in 1983. In 1984, works began to extend Entre Campos to Campo Grande (then called Cruz Norte), when plans to build a station at Calvanas, near the Júlio de Matos hospital, had already been abandoned. By the end of the decade, on October 14, 1988, the extension connecting Sete Rios to Colégio Militar/Luz was inaugurated, opening three stations: Laranjeiras, with artwork by Sá Nogueira, Alto dos Moinhos (artwork by Júlio Pomar), and Colégio Militar/Luz (artwork by Manuel Cargaleiro). Cidade Universitária (connected to the Campo Grande campus of the University of Lisbon, with artwork by Maria Helena Vieira da Silva) opened at the same time, as part of the extension from Entre Campos to Campo Grande. These four stations were the first to be built from scratch with platforms long enough to receive six cars (105 metres) and with artwork in the platforms themselves. Bela Vista station (Red Line). Lisbon Metro System in April 1993. 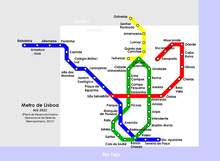 Lisbon Metro System in July 1995, when the Yellow Line was created. Lisbon Metro System in March 1998, when the Green Line was created. Lisbon Metro System in November 1998, upon the completion of the Red Line. In 1990, the Network Expansion Plan was presented, which included extensions from Rossio to Cais do Sodré and from Restauradores to Baixa-Chiado, splitting the Y in Rotunda (extending the branch from Picoas to a new station, Rato) and the extension Colégio Militar/Luz–Pontinha (including a new depot near the Pontinha station, PMO III). In 1991, the first prototype of the ML90 car series was presented, consisting of two triple units (motor-trailer-motor) of six cars (with the first unit being numbered M-201, R-202 and M-203), built by Sorefame/Bombardier. These cars had a digital destination sign, were generally more comfortable and could operate with or without the trailer. The motor cars in these two triple units were also the only ones to have a front door to the cab, which was not included in further batches. On April 3, 1993, the Campo Grande station opened, along with the expansions Alvalade–Campo Grande and Cidade Universitária–Campo Grande. With this extensions, the network grew 3.1 miles (5.0 km). In the same month, the ML90 prototype cars were used for the first time. Line D (red): Alameda – Moscavide. The PMO II depot on the green line was finished in late 1994, after eleven years of works. At the end of this year, the second batch of ML90 was ordered, consisting of 17 triple units (or 51 cars). On July 15, 1995, lines were finally split at Rotunda, with Metro now operating in two lines: Line A (blue), between Colégio Militar/Luz and Campo Grande, through Rossio, and Line B (yellow), between Campo Grande and Rotunda. The old Rotunda station (now Rotunda I) was extended from 75 to 105 metres and totally refurbished, while the new station (Rotunda II) already had a dock with 105 metres. By the end of 1996, the second batch of ML 90 (numbered M-207 to M-257) was ready; colors and materials used in this second batch differed somewhat from that made up the first. The rolling stock was now composed of 191 coaches: 80 of them ML7, 54 ML90 and 57 ML79. On 18 October 1997, the Seagull line expansion from Colégio Militar/Luz to Pontinha opened, expanding the network by 1.6 kilometres. In December the same year, Rato opened, 600 metres from Rotunda II. Orders for new rolling stock continued in 1997, when half of the cars now known as ML95 were delivered (19 electric triple units, motor-trail-motor, or 57 cars). These new coaches, which look similar to ML90, have some technical differences, like a different engine and electrical door control (unlike the pneumatic control used on its predecessors). The new logo of the Lisbon Metro was first inserted into these new coaches. In April the section Rossio - Cais do Sodré (1.4 kilometres) was opened, with two stations: Baixa-Chiado and Cais do Sodré, the latter connecting to the train and boat stations. The Red Line (Line D at the time) would be inaugurated on May 19, 1998, three days before the opening of Expo 98. 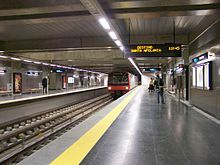 This line was 5 kilometres long and included five new stations: Alameda II, Olaias, Bela Vista, Chelas, and Oriente, and was, in June of that year, the first line to be served with six car trains, in order to satisfy the demand of passengers visiting Lisbon during Expo '98. By this time, the entire ML95 series had been delivered, numbered M-301 to M-414. Later in 1998, Olivais (in August) and Cabo Ruivo (in July) opened in the Red Line, between Chelas and Oriente. The rolling stock was then composed of 305 cars – 80 ML7, 54 ML79, 57 ML90 and 114 ML95, and the network comprised 40 stations. In 1999, the PMO III depot opened near the Pontinha station, replacing the old PMO I depot at Sete Rios, in an event where the prototype of the future car series (now known as ML97) was presented, which would consist of 18 articulated triple units (54 cars). The main difference from the previous series was the possibility of free movement between each car. In addition, the prototype had a more modern image, and also introduced digital automatic passenger information. According to the operator, the trailer of these triple units can be removed, although this has never been witnessed. The first cars were issued during 1999, numbered M-501 to M-554. The rolling stock, at the turn of the millennium, was made of 361 cars of five train types (80 ML7, 54 ML79, 57 ML90, 114 ML95, 54 ML97) the largest number of train cars to date before the retirement of the ML7 and ML79 series in 2000 and 2002 respectively. Lisbon Metro System in August 2009. Lisbon Metro System in July 2012. Terreiro do Paço station atrium (Blue Line). Terreiro do Paço station (Blue Line). Santa Apolónia station (Blue Line). In 2002, under Manuel Frasquilho's tenure as president, the Green Line was expanded from Campo Grande to Telheiras. Two years later, in 2004, the network spanned the geographical limits of the city: first, in March, with the expansion of the Yellow Line from Campo Grande to Odivelas (which included five new stations); then, in May, the Blue Line was extended from Pontinha to Amadora Este. On December 19, 2007, after 11 years of construction, the extension was opened between Baixa-Chiado and Santa Apolónia, with some controversy and many successive delays due to the difficulty of construction. In 2000, when three years would be expected in its completion, there were cracks in the tunnel that led to land subsidence. The consequent flooding of the tunnel seriously slowed down the completion of work and road traffic at the Praça do Comércio and part of the Avenida Infante D. Henrique was forced to be cut temporarily. A new tunnel was made in place of the first. The stations themselves (Terreiro do Paço and Santa Apolónia) were completed in the summer of 2007. On August 29, 2009, the Red Line section between Alameda II and São Sebastião II was inaugurated, such that all lines now cross each other. On July 17, 2012, the Red Line was extended between Oriente and Aeroporto, adding 3.3 km to the network. Three new stations have been inaugurated: Moscavide, Encarnação and Aeroporto, which is directly linked to the Lisbon Portela Airport. A journey from the central Saldanha station to the Lisbon Airport now only lasts about 16 minutes. The Oriente Line also serves the Moscavide neighbourhood, and will carry some 400 000 extra passengers each year. Map of Lisbon Metro services by 2022. On May 8, 2017, the government of Portugal announced an extension of the Yellow Line to Cais do Sodré as part of a new operational master plan. The extension, which will connect the Yellow Line with the Green Line, will contain two new stations at Estrela and Santos, along with a reorganisation of the track layout at Campo Grande. Once the extension opens by 2022, the Green and Yellow lines will be reorganised: the Green Line will run as a circular route and will take over the section of the Yellow Line between Campo Grande and Rato, while the Yellow Line will run between Odivelas and Telheiras. December 1959: original "Y"-shaped network opened with 11 stations (Sete Rios, Palhavã, São Sebastião, Parque, Rotunda, Avenida, Restauradores, Picoas, Saldanha, Campo Pequeno, and Entre Campos). There were two routes: one from Sete Rios to Restauradores (which later became the Blue Line), and one from Restauradores to Entre Campos (which later became the Yellow Line). January 1963: The network was expanded east by one station (Rossio). September 1966: The network was extended from Rossio northwards (three new stations were built: Socorro, Intendente and Anjos). April 1993: Campo Grande opens as the first elevated station in the system; temporary service between Rotunda and Colégio Militar/Luz via Campo Grande commences. July 1995: Rotunda disconnected; single 'Y' line divided into two separate lines (Blue and Yellow); public display of a new modernization plan that involves the creation of several independent interconnected lines and a new corporate identity. 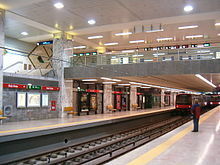 March 1998: Disconnecting the section Restauradores – Rossio; Creation of the Green Line (Socorro, Intendente, Anjos, Arroios, Alameda, Areeiro, Roma, Alvalade and Campo Grande - common to the Yellow Line), renaming of several stations: Rotunda to Marquês de Pombal, Sete Rios to Jardim Zoológico, Palhavã to Praça de Espanha, and Socorro to Praça Martim Moniz. December 2007: New stations in the Blue Line: Terreiro do Paço and Santa Apolónia. August 2009: New stations in the Red Line: Saldanha II and São Sebastião II; first time that all 4 lines are truly interconnected, strengthening the network. 2010: Several stations on the Green Line are being lengthened to accommodate 6 car trains, enabling standardisation of rolling stock. 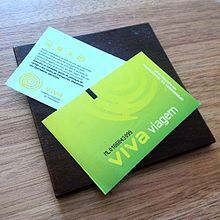 July 17, 2012: New stations on the Red Line: Moscavide, Encarnação and Aeroporto. The line now connects Saldanha station to Lisbon Airport in just 16 minutes. April 7, 2016: Blue Line extended from Amadora Este to Reboleira railway station. This involved extending the tunnel from Amadora Este, which passes under the former spur track linking the Sintra Line of CP to the old Sorefame factory towards the Reboleira metro station located under the said train station. The opening was originally planned for 2011–2012. However, the opening of the extension was delayed for four years due to financial difficulties. The future: Planning is underway for a Red Line extension from São Sebastão to Campolide (and eventually Campo Ourique/Amoreiras); there is no timetable for construction. Map of Lisbon Underground with all planned future expansions. The Lisbon Metro comprises four lines running on 43.2 kilometres (26.8 mi) of route and serving 55 stations. The lines were formerly known by picturesque names; logos based on the former names are still used. These picturesque names are still used as secondary names. Metro service starts every day at 06:30 and stops at 01:00 (the last trains arrive at the terminal stations by 01:30). However, some station exits close before 01:00. Trains run at a 5–8 minutes headway. Both cards can also be used on other modes of transport like Fertagus, CP (including its suburban rail service) and the Transtejo & Soflusa ferry service. Currently, four types of trains are in service on the Lisbon Metro. The architecture and decor of an underground station is a key element for the well-being of passengers, and art works to make travel more appealing. Lisbon Metro is one of the various underground systems in the world where art is best represented, much like the Munich U-Bahn in Germany, Moscow Metro in Russia, Montreal Metro in Canada and the Stockholm metro in Sweden. From the beginning, there was a concern to make a smooth visual transition between surface and underground. Architect Francisco Keil do Amaral (1910–1975) designed a station model, which was used as a template for all stations built until 1972. In this model, the decor was very moderate, with smooth but firm lines, much like the Portuguese political regime at the time. The original eleven stations, except Avenida, had artwork by painter Maria Keil (1914–2012). In 1988, with the completion of new expansions, there was still a concern about organizing and decorating stations, thus these stations featured works by contemporary Portuguese artists: Rolando de Sá Nogueira in Laranjeiras, Júlio Pomar in Alto dos Moinhos, Manuel Cargaleiro in Colégio Militar/Luz, and Vieira da Silva in Cidade Universitária. Since then, art has become the norm in the Lisbon Metro; lighting plays with the brightness of the azulejo tiles that are present in almost every station. In recent years, the oldest stations have been refurbished, not only to enhance the decor and aesthetics, but also to improve accessibility for passengers with reduced mobility. Parque station is generally considered to be the most valuable and interesting of them all, where the tiles reflect and work on Fernando Pessoa's universal literary heritage. ^ a b c d e "O Metro em números – Evolução da rede" [The Metro in numbers – Network evolution] (in Portuguese). Metropolitano de Lisboa, E.P.E. Retrieved 2017-05-10. ^ "Linhas Azul e Amarela reforçadas de manhã na hora de ponta" [Service in Blue and Yellow Lines will be improved on morning rush hour] (webpage) (in Portuguese). Público. 2018. Retrieved 2018-01-17. ^ a b "Intervalo entre comboios" [Time between vehicles] (in Portuguese). Metropolitano de Lisboa, E.P.E. Archived from the original on December 31, 2016. Retrieved December 30, 2016. ^ Extension to Aeroporto, public opening, Metro Lisboa, metrolisboa.pt, 16 July 2012. ^ "Ligação do Rato ao Cais do Sodré dá linha circular a metro de Lisboa". Público (in Portuguese). Retrieved May 10, 2017. ^ Reboleira extension to open on April 7, 2016, portugalferroviario.net, 3 March 2016. ^ Work in Reboleira underground station suspended Archived 2012-04-21 at the Wayback Machine, publico.pt, 27 January 2012. ^ Underground: opening of Reboleira station delayed to 2014, Visão, visao.sapo.pt, 27 January 2012. ^ Empreendimento Reboleira Archived 2012-07-07 at the Wayback Machine, Metro Lisboã, metrolisboa.pt, 16 July 2012. This page was last edited on 29 March 2019, at 23:14 (UTC).